In 2016, Ben Kallos arrived for the Tram's 40th Anniversary bash, rehearsing his speech as he crossed the East River. 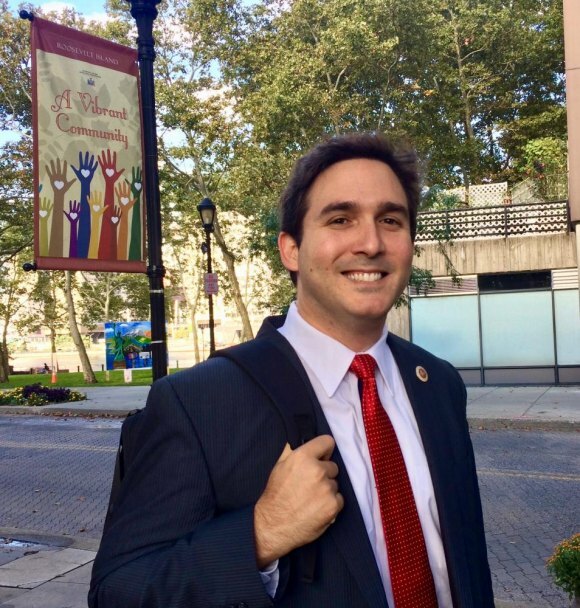 Last week, on February 5th, progressive politician, City Council Member representing Roosevelt Island, Ben Kallos turned 38. Last night, he celebrated with supporters paying $175 a pop for a gala fundraiser at the Guggenheim Museum. It raised more than money, like the question: what's this guy running for next? It's not unusual, to say the least, for politicians to hold gala fundraisers, and it shouldn't surprise anyone that a Council Member as popular as Ben Kallos sold his out. A progressive in a heavily liberal district, Kallos continued the acceleration of his grassroots campaign in 2013 in which he upset favorite Micah Kellner, evolving it into an office heavy on constituent services that keep him involved with communities at multiple levels. Back in the summer of 2016, we wrote that Ben Kallos is everywhere. His energy level is high, and he seems not just at ease, but energized when he meets the public at ceremonies, groundbreakings, town hall meetings and the like. Rare is the Roosevelt Island event where Kallos doesn't show up with his signature smile. Most recently, he pitched a shovel at a fake groundbreaking for the new public library. He was there, the actual bearer of the scissors for ribbon-cutting when Trellis reopened as Nisi, and he helped RIVAA and RIOC unveil the plinth, last summer, that set a new marker along the Island of Art Trail. Anyway you look at it, Kallos has been an active, involved supporter of Roosevelt Island as well the other neighborhoods, from Harlem to Murray Hill, that count on him. December, 2018, Kallos was on hand to help open Nisi. But his City Council term expires on January 31st, 2021, and he's term limited out of running for that office again. 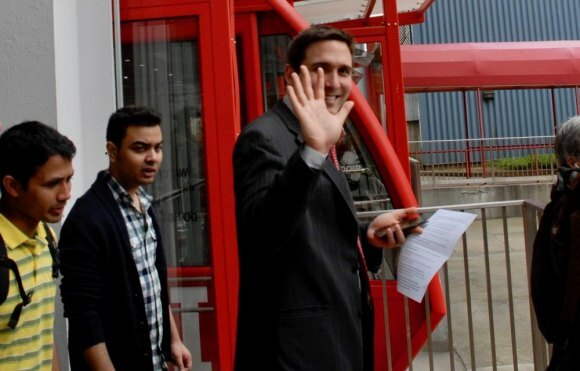 So, What's Ben Kallos Raising Funds For? 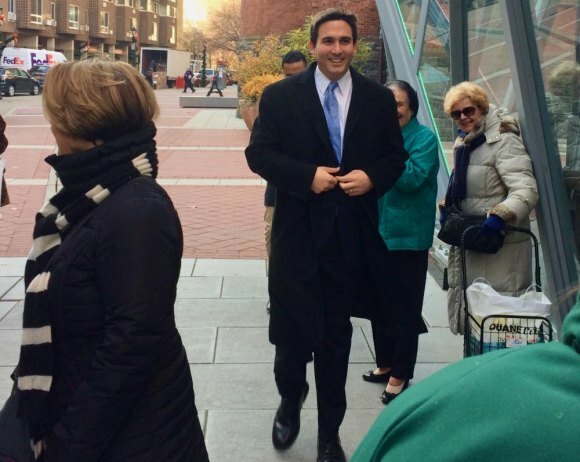 "Council Member Ben Kallos, is humbled by the community support for him to run for higher office. 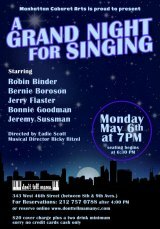 Whether it is winning campaign finance reform for a chance to get big money out of politics, standing up to real estate by rezoning to stop super tall buildings propped up on empty voids, ferry service and more school seats for Roosevelt Island and the Upper East Side, or hundreds of millions secured for parks, one thing is clear, residents throughout New York are excited with the opportunity to partner with Council Member Kallos to see what they can accomplish together!" What we can take from that for sure is, Ben Kallos is not retiring any time soon. And he's not tipping his hand on next steps until the time is right. In the meantime, he's got a City Council district to look after. When time came to break ground for our new public library, Kallos was there to raise a shovel.